From the ability to understand and use shop mathematics to the reading and interpreting of shop drawings, the editor's intent is to provide the information and know-how that students will need as they prepare themselves for jobs in metalworking industries. It includes material taken from Machinery's Handbook and other authoritative sources and is presented in as clear, accurate, and easy-to-follow form as possible. The reader will find a wide range of useful formulas and data together with extensive text. 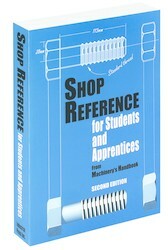 As a proven and affordable handbook covering those critical areas of interest commonly encountered by machinists, toolmakers, diemakers, drafters, and other shop and manufacturing personnel, it is an essential reference for students in vocational schools, technical institutes, and apprenticeship courses. Discusses those aspects of applied mathematics needed on the job and covers the proper use of measuring instruments and methods. Outlines the standard methods of presentation and the conventions used in preparing engineering drawings. Offers detailed information on inch and metric standard tolerances, allowances, limits and fits, preferred numbers and sizes, as well as in-depth descriptions of the sizes, forms, dimensions of standard machine elements commonly encountered in and around the shop. Provides machining methods and materials selection, recommended speeds and feeds for various kinds of machining operations on different materials, and the types and compositions of metals commonly used in machine construction. Includes an extensive index that will enable the user to quickly and conveniently find the information and data that he or she requires.